This add-on water filter can be used with any brand refrigerator including Maytag, Whirlpool, LG, EG, Kenmore and many more. It installs into the 1/4 inch water line running to the back of the refrigerator with two 1/4″ compression fittings. 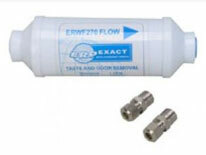 This water filter removes chlorine taste and odor as well as particulates, sediment and other foreign taste/odors. The manufacturer suggests replacing this filter every 6 months. This is a charcoal based filter.